With the usual big brand suspects rolling out motherboards based on Intel's H77 chipset, it's time for something a little different in the form of the new ASRock H77 Pro4/MVP. 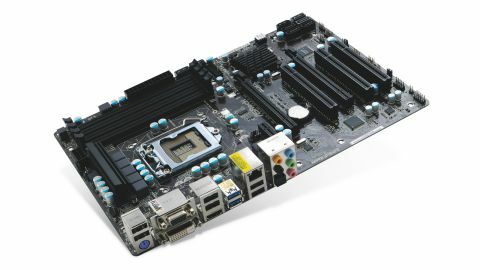 In the past, ASRock had a reputation for quirky and rough around the edges - if competitively priced - motherboards. These days, ASRock still does things a little differently, but its boards are much more polished and still offer great value. The ASRock H77 Pro4/MVP is a great example. Ostensibly it packs in pretty much everything the Asus P8H77-M Pro has, but brings a little more flexibility and expansion to the mix, thanks to its ATX rather than MicroATX form factor, and all for around £20 (about $30) less. In fact, even compared to the Gigabyte H77M-D3H, which is a lot thinner on features, the ASRock H77 Pro4/MVP is cheaper, if only by £5 (about $7.50). Priced at £70 (around $109), the ASRock H77 Pro4/MVP certainly looks like the most cost-effective way to get yourself a motherboard fully optimised for Intel's latest Ivy Bridge generation of PC processors. Like other motherboards based on the Intel H77 chipset, serious overclocking isn't an option with the ASRock H77 Pro4/MVP. Unfortunately, you don't have full access to the CPU multiplier. So, what we're looking for is solid performance at stock clocks. That's pretty much what it delivers. Admittedly, it's a little off the pace by most of our benchmark metrics. But we're talking about fractions of a frame per second rather than anything you'll notice in the real world. There are one or two ways where you can see how ASRock has cut costs. But raw performance isn't one of them.